Deal: LG V30+ 128GB (US unlocked) is down to $774, save $155! 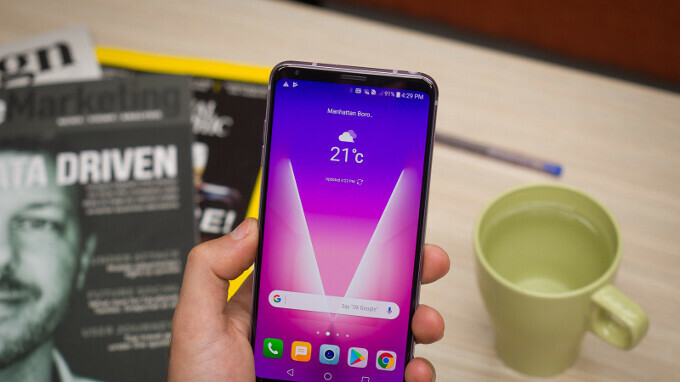 If you are waiting for the right time to buy the LG V30+, you'll be happy to know that B&H has the handset on sale. LG's finest 2017 phone typically retails for $929.99, but right now, you can get it for $774.99. That's a discount of $155 or 17%. Keep in mind that these are US unlocked units that can have LTE on all GSM and CDMA networks, meaning that they are pretty much compatible with every major Stateside carrier. Another cool perk is that you can extend the warranty of this phone to two years. The price of this particular model has also been cut to $774.99 on Amazon today, but the e-commerce site doesn't have the product in stock at the time of writing. There are two major differences between the V30+ and the regular V30 - the Plus model offers 128GB of internal storage, twice as much as the regular model. Also, you do get a pair of LG QuadPlay Headphones with the V30+. Otherwise, the main specs of the two phones are identical - you get a beautiful 6-inch OLED screen, the Snapdragon 835 SoC, 4GB RAM, 16MP + 13MP main dual camera, and a 3,300 mAh battery. If you want to get the full scoop on LG's latest and greatest, feel free to check out our written review for the phone. If this deal intrigues you, make sure to follow the above link to B&H. Personally, I think its market price is less or similar to Note 8. Note 8 has better screen and camera, also more refined software. V30/30+ have better sound. 1- More manageable size? The V30 is wider than the Note 8 2- Can't argue that. 3- It's subjective, but let's not forget that the V30 looks like an S8 from the front, and that shiny reflective glass back is inspired from Samsung's flagships that has been using this design for 3 years now. 4- Camera isn't subjective, the V30 is hailed for the video mods it's camera app offers, not it's quality, and also the wide angle lens. It's not even a top 5 camera in terms of quality this year. Don't forget about the awful front facing camera. And again, it's funny how you cherry pick what's subjective or not. 5- Not one review on the internet compliments LG's UI, it's a complete mess that combines the looks and features of Samsung, Apple, Huawei, and old LG UIs. Yes many may prefer it over Samsung's software, but the vast majority don't. And yes, let's not talk about screen, battery life, S-pen, IRIS scanner, and few other features that you intentionally didn't talk about. Now do us a favor, and StopTalking. all phones should be less than $500, i spent $2000+ to get 2 newest phones last year, and realized they are not better than a mid range phone. So true exept the cameras are ok in the mid-rangers. Still haven’t seen a V30 at Best Buy or in the wild. Please don’t remove this comment PA. Still need a answer why you removed other comment.